Benchmark results are in, and the new Core 2 MacBooks come out about 7% faster overall than the "Core1" models they replace. Not a bad improvement for no increase in price, and MPEG2 encoding improves by 20-25%. One way to increase your 'Book's battery life has been underclocking. For instance, my old PowerBook G4/400 could be notched back to 300 MHz for longer use in the field. But now we're seeing another approach: undervolting, which lets you increase battery life with no performance penalty. And it runs cooler. The new CoolBook software brings that to MacBooks, and field reports on the Windows side of things are reporting roughly 20% greater battery life by undervolting. This could be a great way to keep those Core Duo MacBooks from overheating, as the CoolBook site shows a drop of 13-15°C (18-27°F) when undervolting. Apple has released Firmware Updates for all Intel Macs, inlcuding the MacBook and MacBook Pro models. "Switching from a Core Duo processor to the next-generation Core 2 Duo will yield a performance boost. Our benchmarks for the recent iMac and MacBook Pro updates revealed as much. Like those two product lines, the wildly popular MacBook laptop also got a processor upgrade to the Core 2 Duo; however, clock speeds remain unchanged from the previous installment of consumer portables. As a result, the gains from this update were much more modest than what we've seen from previous Core 2 Duo-powered systems." "Everyone's heard of overclocking a CPU to wring the last few drops of performance out it, right? Well, a notebook jockey's equivalent is called 'undervolting' and it's designed to increase battery life not clock speed. "The technology used is called undervolting and even if reducing the voltage would be a more precise description the name is still pretty easy to get. By lowering the voltage to the processor you can not only drastically lower the heat dissipation, but also increase the battery time significantly. There are, believe it or not, no downsides with this method, if you do it right...."
"Hot on the heels of my story yesterday about undervolting your Core Duo CPU to save on battery and heat comes a nifty piece of shareware. CoolBook is a GUI to control CPU clock speed and voltage. It's like the author was reading my mind! "CoolBook is a $10 shareware application for the MacBook and MBP that allows you to adjust the frequency (clock speed) and voltage of Intel Core Duo and Core 2 Duo CPUs. "In my experience Core 2 Duo MacBook Pros can run as much as 40°F cooler than Core Duo machines. I don't consider these voltage/frequency/fan tweaking applications necessary on newer C2D machines, but they're practically required for Core Duos. Especially if you want to use your machine on your lap." "When the 15-inch MacBook Pros got bumped to Core 2 Duo, their 17-inch counterparts joined them in the processor bump. However, while the 15-inchers were supposedly available immediately (although some of our staff members would beg to differ), the 17-inch MBP was supposed to ship within the next week or so. That was a few weeks ago, and the buyers of 17-inchers are still waiting." "This holiday season, shoppers are expected to spend a whopping $1.6 billion on extended warranties for laptops, flat-screen TVs, other electronics, and appliances. Products seldom break within the extended-warranty window (typically around three years), our data show. When electronics and appliances do break, the repair often costs about the same as the cost of the warranty. "We have long advised against extended warranties. In fact, we feel so strongly that consumers are being misled about them that we took out a full-page ad in USA Today on Nov. 14 (see below) to warn shoppers." 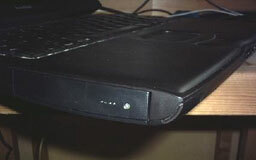 "Once you plug in your Novatel V640 ExpressCard on Verizon or your Franklin CDU-550 USB Modem on Sprint, your Mac has wireless broadband Internet, but many have found that running Parallels cannot access the Internet, even though your Mac has an Internet connection. This technote will step you through, the settings to allow your single EVDO connection to be used from your Mac or Windows running under Parallels. Franklin CDU-550 EVDO USB Modem for Sprint"
PR: Samsung Electronics Ltd., the worldwide digital consumer electronics and information technology forerunner, ratchets up the strength of its 2.5" hard disk drive offerings for notebook and enterprise computing applications with the introduction of the powerful new M80 SATA Series and M80 Series. Both series utilize advanced Perpendicular Magnetic Recording (PMR) technology, feature an optional industry leading free-fall sensors and offer increased storage capacity, now up to 160 GB. The M80 SATA Series features the 80 GB HM080HI, the 120 GB HM120II and 160 GB HM160JI. The M80 Series includes the 80 GB HM080HC, the 120 GB HM120IC and the 160 GB HM160JC(1). The M80 SATA Series and M80 Series are Samsung's first hard drives based on PMR technology. Unlike traditional longitudinal recording technology, which lays data bits end to end where they can flip and corrupt data on the disc, PMR technology places the data bits perpendicular to the disc, which reduces the corruption factor. In addition, by placing the data bits standing on end, more data can fit onto a disc, allowing for greater storage capacity. With PMG technology, users can fit up to 40,000 MP3 songs and 160 hours of video on a 160 GB Drive. Samsung's newest 2.5" drives offer users increased damage risk protection by incorporating industry-leading free-fall sensors. Many notebook hard drives on the market today have an operating shock tolerance - the amount of shock the drive can take before damage - up to 325G. Samsung's new drives with the free-fall sensor provide an industry-leading 700G of operating shock tolerance. Hard drives enabled with the free-fall sensor are better able to detect changes in acceleration caused by a freefall. The free-fall sensor parks the drive's head on the ramp and turns the hard drive off, protecting it from damage caused in a fall. This offers a dramatic increase in reliability and resistance to hard drive damage caused in the event of a fall. Unlike much of its competition, Samsung's free-fall sensors are located on the hard drive, not the notebook's motherboard. The added benefits of this onboard integration include faster response time in the event of all fall, an improvement in the quality of fall detection, and a smaller minimum fall detection rate of just 30cm. "The rate of today's mobile workforce and notebook PC users is rapidly growing like never before and Samsung is committed to providing the most advanced, technically sophisticated hard drive solutions available today," said Albert Kim, National Sales Manger, Storage Systems for Samsung Semiconductor, Inc. "The M80 SATA Series and M80 Series, armed with PMR technology, free-fall sensor capability and increased storage capacity work behind the senses to ensure users have all of the tools necessary for the most pleasurable computing experience possible." Targeted for mobile computing needs as well as enterprise applications, the M80 SATA Series and M80 Series feature a 8 MB of onboard data cache and high performance 5,400 rpm spindle speed. The new hard drives provide cutting-edge shock protection capability through an advanced mechanical platform and able-bodied cover design engineered to minimize the intensity of external shock transmitted to the most critical components of the drive. Samsung's latest 2.5" hard drive offers are equipped with the company's Hybrid Latch System, a revolutionary new latch mechanism that eliminates unpleasant rattling noises and significantly reduces the clicking noise generated when a drive moves its heads on and off the disk according to the operating modes. The drive uses a Fluid Dynamic Bearing motor to achieve an industry-leading operating acoustic noise levels. The M80 SATA Series and M80 Series feature 80 GB formatted capacity per disk, Fluid Dynamic Bearing Spindle motor technology, ATA SMART feature set, ATA Automatic Acoustic Management, ATA Device Configuration overlay and Multi-Burst On-The-Fly Error Correction. Utilizing Samsung's SilentSeek™ technology, the drives provide are among the quietest in the industry today. You can only use this to restore the firmware after an interrupted or failed update. If your computer is already in this state, you'll need to download the software and create the CD on another Macintosh computer, or you can take your computer to an Apple Store or Apple Authorized Service Provider to restore your firmware. This CD can be created on both PowerPC- and Intel-based Macintosh computers. iMac and MacBook LCD panel brightness may brighten up to the maximum level when you connect or disconnect an external display. Solution: Adjust the display brightness - on Apple portable computers, adjust the display brightness using the F1 and F2 keys at the top left of the keyboard. On iMacs with an Apple keyboard, adjust the display brightness using the F14 and F15 keys at the top right of the keyboard. This developer note gives a technical description of the Intel Core 2 Duo MacBook computers introduced in November 2006. The purpose of this note is to provide information about the computer's internal design, input-output features, and expansion capabilities to help developers design products compatible with MacBook. PR: Ever suffered from laptop notebook computer heat problems? The Cool Lift laptop stand is just for you. 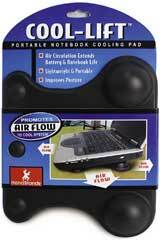 Designed to promote airflow, the Cool Lift laptop stand helps make your laptop as cool as you've always wanted. Due to its angled design, it also promotes good posture, and helps prevent carpal tunnel. Works with all laptop sizes. Flying J's, airports, and all others. Any ISP including Earthlink, Cox, Comcast, AOL and all local ISPs. Compatible with Linksys, Netgear and more. Much faster than other wireless cards - Web pages load instantly. Card is instantly recognized every time you open your PowerBook. Compatible with virtually all 802.11g and 802.11b routers including AirPort Express Base Station. Apple PowerBook OS X PCMCIA Wireless Card for Mac WiFi: $49.95 plus postage: $4.99 US / $8.90 worldwide. PR: FastMac has announced that it has begun shipping the highest capacity, extended life battery upgrade for Apple's PowerBook G3 Pismo and Lombard computers. The new 84 Whr battery uses Lithium-Ion cells (with integrated charge indicator LEDs) that are manufactured to the highest quality standards and utilizes TruePower technology to provide up to 68% more capacity than the original Apple battery. FastMac's TruePower battery for the PowerBook Pismo and Lombard is available now for a special introductory price of $139.95 & can be combined with a G4 550 MHz Pismo processor upgrade for a special bundle price of $349.95 ($50 savings). Each battery carries a 1 year warranty and a 30 day money back guarantee. FastMac's TruePower battery can also be combined with a G4 550 MHz processor upgrade to obtain the ultimate PowerBook Pismo. Combining FastMac's low voltage, low-power, and cooler running G4 Processor design with the highest capacity battery on the market yields even longer battery run times than a stock PowerBook Pismo. "With the Pismo's 2 battery bays and our G4 upgrade, you can literally go halfway around the world without a recharge," said Michael Lowdermilk, Business Development Manager for FastMac Performance Upgrades, Inc. "There is no doubt that this is the best battery for your PowerBook." FastMac says its line of TruePower batteries for laptops are engineered using the highest quality, high-capacity Lithium cells, keeping safety in mind at all times. FastMac utilizes custom form factors and materials to achieve a superior fit and finish, matching the original battery whilst increasing capacity. Each battery is individually tested and includes safety features to protect against overcharge, overheating, short circuits and power surges. 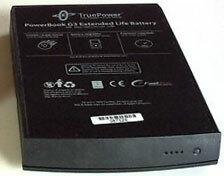 All TruePower batteries carry at least a 1 year warranty and in some cases, a 2 year warranty. FastMac's TruePower line includes battery upgrades for all iPods & all Apple portables released after 1997, including the world's longest lasting PowerBook battery with up to 68% more capacity than the original. FastMac is also first to market a replacement battery for Apple's latest MacBook portables. 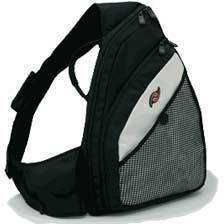 PR: Need a light bag to fit your one and only, the Fling carries a MacBook in style. Cushioned computer nest, inner compartment accessory space, front compartment with sunglasses, pen & key pockets, plus a media player cache... its great when things are designed to just fit. PR: Temperature Monitor Widget Edition is the Dashboard version of its "bigger brother" Temperature Monitor. It is recommended that you use Temperature Monitor first before using the widget edition to learn more about the sensor equipment of your computer. The applications are designed to give you access to all temperature sensor readings Mac OS X uses to monitor and cool your computer. The widget allows you to select two of your computer's temperature sensors which should be displayed via Dashboard. Unlike other widgets, Temperature Monitor is capable of processing the hardware calibration data Apple stores individually into each G5-based computer. So it displays the exact readings Mac OS X internally uses for cooling control, not just an "educated guess". Temperature Monitor Widget Edition is the small gratis version of the application Hardware Monitor Widget Edition. Hardware Monitor is capable of displaying "non-temperature" sensors additionally. Temperature Monitor Widget Edition is part of a software suite of 9 different monitoring applications which can be used for numerous purposes. Temperature Monitor Widget Edition is electronically distributed software. You can download the product free of charge. New in version 2.0: Added support for a large number of new temperature sensors of Intel-based Macintosh systems. This includes thermal diodes monitoring the processors externally, GPU sensors, drive bay sensors and FB-DIMM sensors of the Mac Pro, etc. This prerelease version of Lilt is being offered to the general public without any restrictions except that it will cease to function after November 30, 2006. When Lilt is formally released, it will be fully functional shareware for sale for $5. Since this is a prerelease version, there may be imperfections or faults in the software. It is being released to the public to try and iron out any bugs that it may contain before the shareware version is released. Added Active Application Sets. Create a new set per application to only trigger actions when the target application is frontmost. Adding actions to the default set will trigger them when any application that does not have its own set is frontmost. Added customizable read interval. Smaller intervals will make Lilt more responsive to changes but will utilize more CPU cycles. The release of new Core 2 Duo powered MacBooks has precipitated another ratcheting down of prices on refurbished Macintel notebooks at the Apple Store. You can now get a Core Duo MacBook for $899, one with a SuperDrive for under $1,000, and a MacBook Pro for $1,399! If there was any doubt that the switch to Intel chips would result in lower prices, they should now be erased.